Vanilla, the second most expensive spice in the world after saffron, came to India in 1850. It is an orchid plant and the subspecies that is grown extensively in India is Vanilla planifolia or Bourbon vanilla. The other two subspecies are Vanilla tahitensis and Vanilla pompon. All three have evolved from a single species found in Mesoamerica. 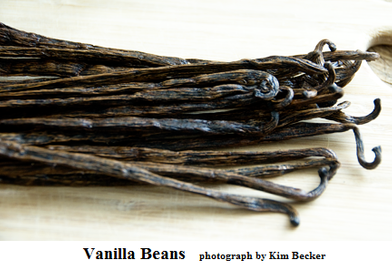 Bourbon vanilla beans have a strong aroma and are long, slender and have a thick oily skin. The beans are harvested six to nine months after pollination takes place. The beans that change from being a non-aromatic, dark green to a light green with a hint of yellow, can be easily detached once they are ripe. They are then harvested one by one and so it is a labour intensive process. Vanilla beans tend to dry out and become brittle if exposed to the air, but they can last for several months if wrapped in foil and packed in a zip lock bag. This should then be stored in a cool, dark place. If it seems they are drying out in spite of this add them to a jar of vodka. After removing the seeds the pods can be placed in sugar, coffee beans or liqueur, to imbue them with the strong flavour contained in the pods too. Vanilla infused herbal tea can help in digestion. Water boiled with vanilla beans gives relief in case of nausea or stomach problems. Even the aroma of vanilla can quell nausea. Vanillin found in vanilla beans has anti-inflammatory properties and can be used to sooth acne. Its antioxidant property may slow down aging of the skin as they fight free radicals. Traditional home remedies employ vanilla burn for injuries. However, it is safer to use diluted vanilla extract or essential oil on the skin because concentrated application may have an adverse reaction. Vanilla used in cough syrups has mild anaesthetic properties that may provide relief from a sore throat or headache. Toothache and infections can be fought with vanilla. Vanilla also has anti-carcinogenic qualities because the antioxidants in vanillin fight cancer promoting free radicals. It can be used as a mild sedative and anti-depressant. It is used extensively in aromatherapy for its calming ability. Twelve beans of vanilla mixed in a bath along with spearmint, ginger, echinacea, peppermint or cinnamon will help relieve aches and pains. Respiratory congestion can be reduced with the aroma of vanilla opening up the airways. Small quantities of B-complex vitamins in vanilla enable enzyme synthesis, the functioning of the central nervous system and the regulation of body metabolism. Vanilla has also been touted as a natural aphrodisiac. Ingredients: ¼ Kg basmati rice, 100 gms green beans, 2 carrots, 2 onions, 150 gms onion leaves (optional), ½ tsp of ajinomoto, 2 tbsp of sunflower or coconut oil, sugar and salt. Preparation: Half cook the basmati rice. Cut all the vegetables finely and fry them using oil for five minutes. Add ajinomoto and salt and sugar as per taste. Mix the vegetables with rice and cook it for five more minutes. 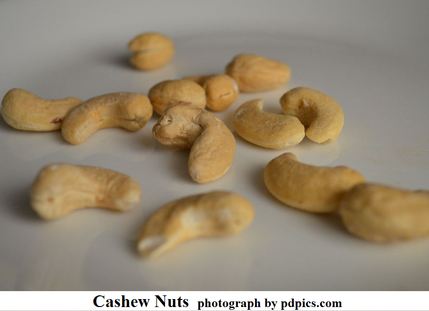 Ingredients: 1 cup of polished cashew nuts, ½ tbsp of cumin seeds, ½ tbsp of coriander seeds, ½ inch cinnamon,1 tbsp of sunflower or coconut oil, 6 cloves, ½ tsp of mace powder, 1-1.5 cups of coconut paste, ½ tsp of chilli powder (optional) and ¼ tsp of mustard seeds. Preparation: Roast cumin seeds, coriander seeds, cinnamon, cloves, mace and chilli powder together and grind to form a paste. Heat oil in a non-stick deep frying pan and add mustard seeds, paste above and coconut paste. Also add cashew nuts, sugar and salt. Add 2 cups of water and cook it for 10 minutes. Powdered seeds of cardamom can be boiled in water with tea for mental depression. An apple with honey can be a good remedy for depression too.